Woke up this morning quite late. Just wanna rest some more cos last night we slept quite late. 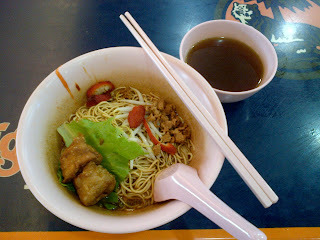 I went to pasar (market) in Hougang near my old-house, had the vegetarian wanton mee.. my favourite noodles in that store. After that, moved to another coffee shop to have a kopi. The kopi there is much nicer than the first coffee shop. I couldn't find my mother-in-law, so I just found a table and had a seat. 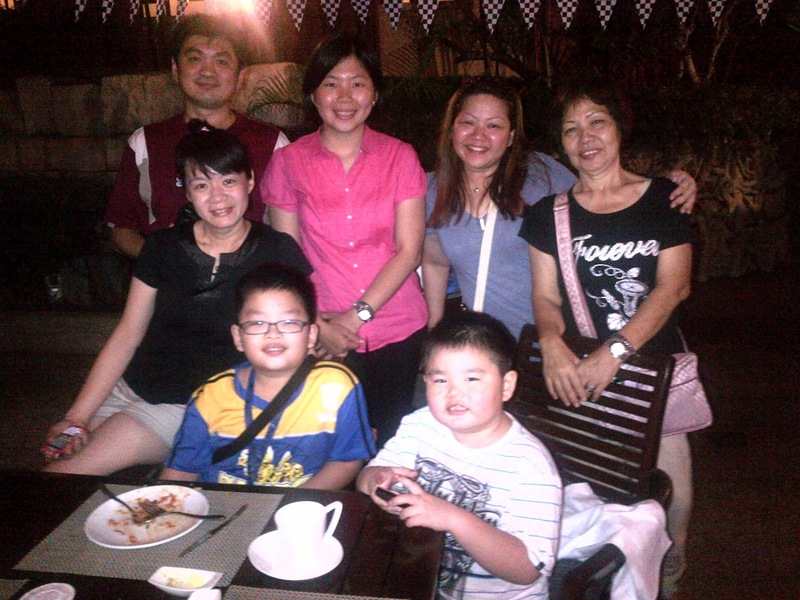 In a while, I saw my two sis-in-law and her two sons. So I asked them to sit with me. My mother-in-law also came to the coffee shop, but she was sitting with her friend. Good la, so I didn't have to sit alone.... hahahahaha...... We chit chatted then went back home at 12pm. 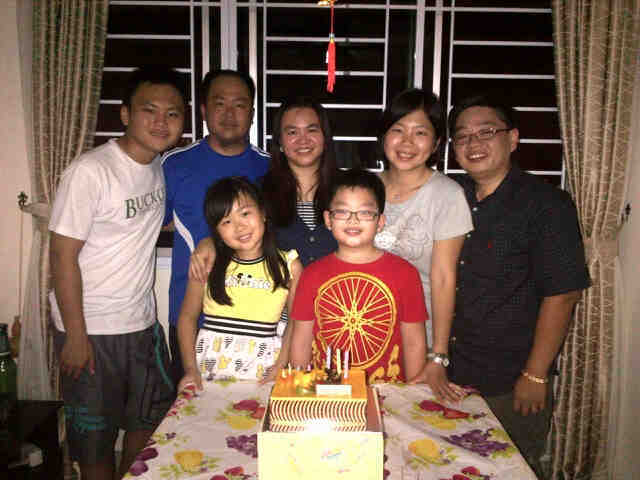 Thank you for Birthday wishes given... I appreciate it very much!!! Thank you to my Mum who gave birth to me and brought me up with my Pa.. Also 4 siblings who had taught me much about life. Without all of you, there won't be 'me' right now. Thanks to hubby too for being understanding of me all these years... Hope to be with you many years to come.... Baobei, thanks for your wishes on the phone this morning too..
Had siomai this evening and pempek for dinner. 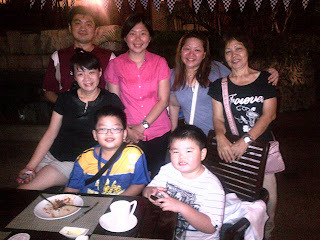 Koko and families came and had pempek together. Well, hope all of you had a great Sunday!!! September, what a busy month!!! 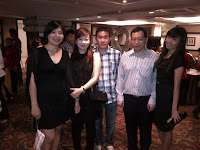 Hubby and I decided to go home from 14-17 Sep, to attend my cousin's wedding. 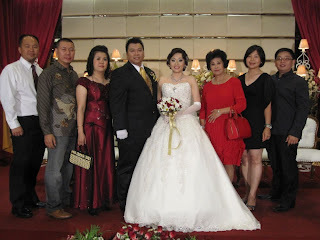 His wedding day fell on 16th. 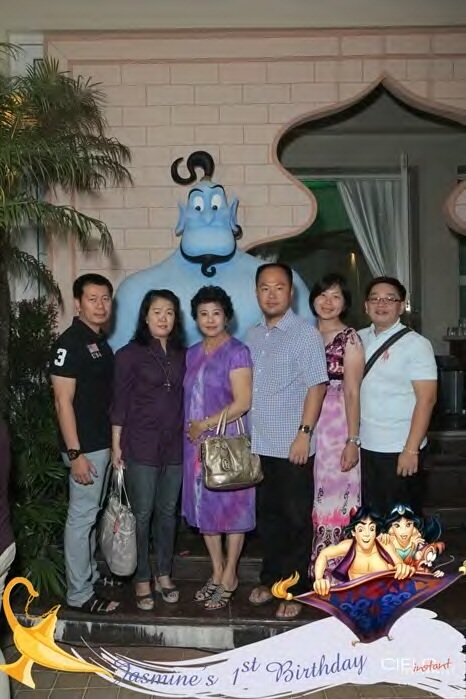 On 15th itself, we attended the cousin's granddaughter's one-year Birthday party. It was an Alladin theme, very interesting! 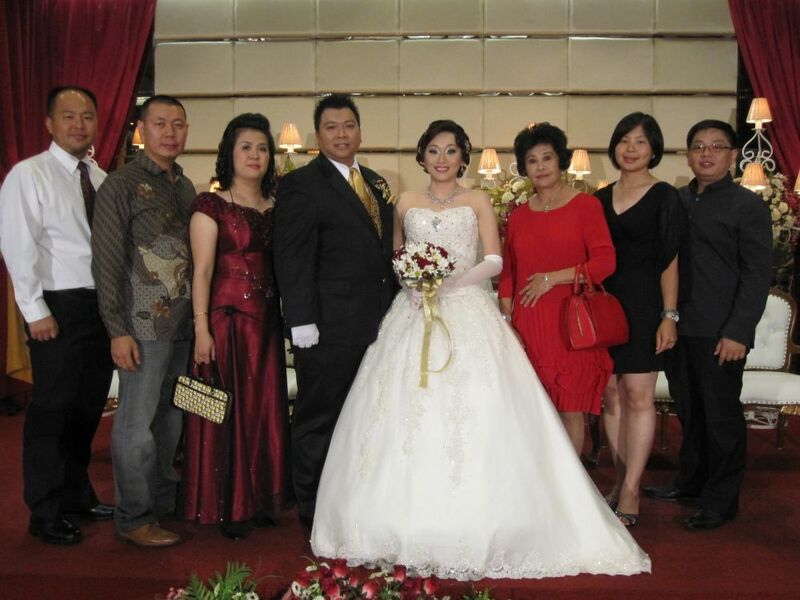 During the cousin's wedding, I managed to meet many relatives and even my childhood friends. How time flies. One by one started to build their own families. Really grateful for everything. I came back alone. 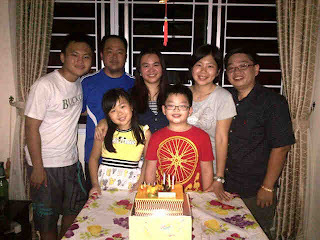 My hubby spent few days more in Pontianak together with my sister, brother, and relatives. Today he is coming back with my brother. On Tuesday, 18 Sep, we had Dinner and Dance in the company where I work. 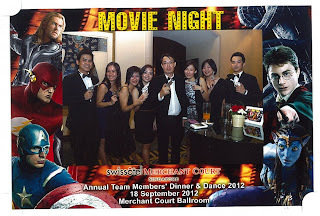 Our dept staff were wearing James Bond clothes. Quite nice. We were chosen as one of the best dressed team, but unfortunately didn't win the prize (we were defeated by 1 point only!!). I won $150 nett dining voucher in Chinese restaurant in Sentosa. Well, maybe enough for 2-3 pax ba... Another colleague won the microwave and he gave it to me. Well, not a very good brand, but our microwave at home was quite old. So it will be good to use it as replacement. On Wed, my friend, his wife and son, came to Singapore. They stayed in our house for few days because the hotel rates were expensive due to F1 and they hadn't booked any hotel earlier. 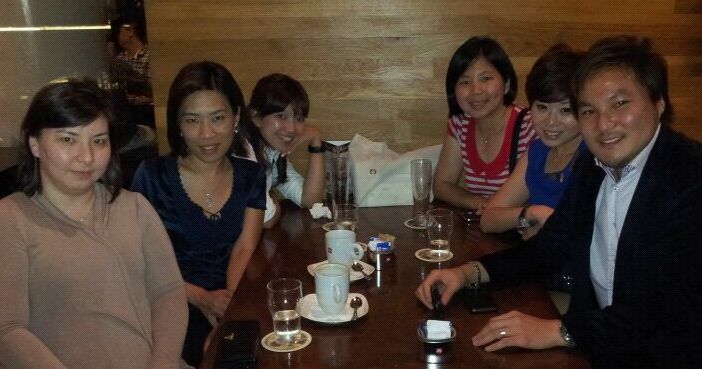 At the same time, my friend from Taiwan came to Singapore and we arranged to meet up for chit chatting and drink. We met at Brotzeit in Vivo. On Sat, Reever and I accompanied my friends almost the whole day. We just went to Compass Point. 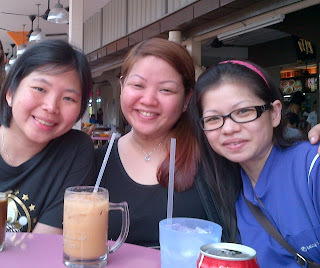 Had a kopi at Yakun, some Malay food at Uncle Toby, then Indian food for lunch @Kopitiam. Ate, ate and ate.... Hehehehe.... They just had some last minute shopping before going back home. Reever missed his Buddhist class again... haiz... and happily did so.. While waiting near the dining table, suddenly it was dark in living room. Astro also turned off the light near the second living room. The TV was on and playing the children birthday song. I was wondering, what happened there.. Why there was another party which I wasn't invited for... hahahaha.. When I stepped there, everyone was there looking at me..
Then I was asking... "What's this? Anyone birthday??" Soso just smiled2.. Then when I looked at hubby, he was also smiled2... Alamak... they were preparing the surprise birthday cake and celebration for me.. I really didn't expect it. Ços I've been used to attend her birthday party only and usually there is nothing special during my birthday. 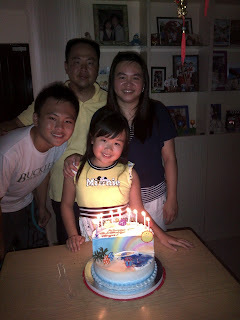 So.. we sang birthday song.. cut the cake... took photos... and ate the cake. Thank you hubby, koko and soso for that.. Also for the rest of the people who were waiting and helping in preparing it... thank you very much!!! I need 2 weeks time to adjust back to where I live now. Came back from Bhutan and Nepal trip. Felt like staying in dreaming world. Felt like go back to 20 years back, where what available was beautiful scenery, natural greenery, fresh and healthy fruit n veggies, and those people were still innocent to today's world. Well, except that they have internet and access to international TV.